Last night I met with the two other room mothers for my son’s Kindergarten class. I love that this school has “room mother’s”. We were trying to decide on some fun but easy crafts to do at the class Halloween party… This was one of the ones we decided on and I’m so glad. I think they are just adorable and so so so easy (and cheap) to make. Perfect for a group of little spooky’s. 1. Cut out a skeleton head and draw a face! 2. 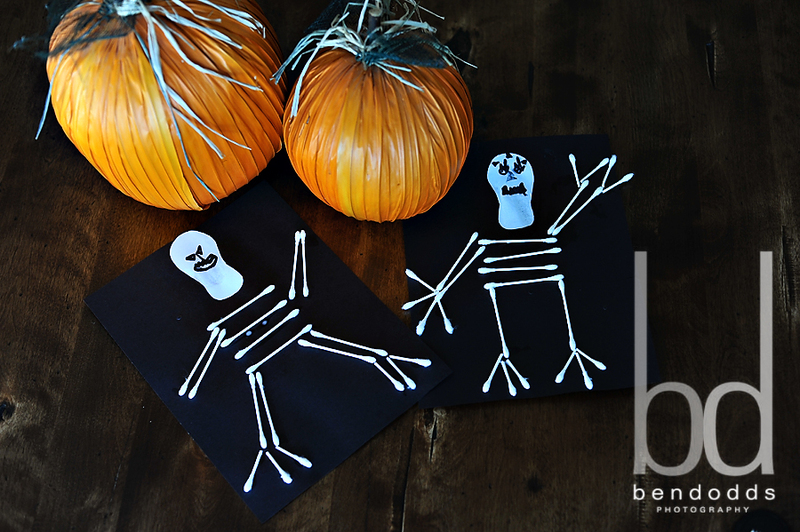 Glue the head to a black piece of paper and then let your child use the glue to stick on the q-tips. We tried two different methods and both worked fine. We put the glue directly on the paper and stuck the q-tip to it and then we also put the glue directly on the q-tip. Both methods worked well! 3. For the phalanges break the q-tips in half. It’s easier to bend them then to cut them!